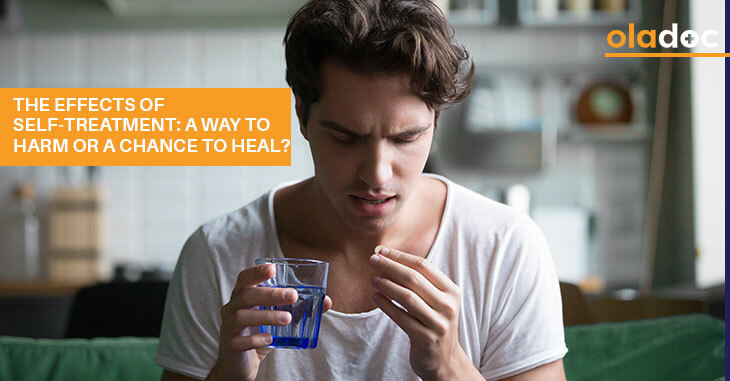 Home » Healthy Lifestyle » The Effects Of Self-Treatment: A Way To Harm Or A Chance To Heal? Self-treatment is a common practice not only in Pakistan, but all over the world. It refers to the use of drugs and non-medicinal approaches, without consulting a medical professional prior to treatment. Therapies such as herbal remedies, massage therapy, acupuncture and even aromatherapy are used by patients for self-treatment. While self-treatment can help reduce the load on the medical services, it is a double edged sword that also has a lot of downsides as well. We discuss the causes, conditions, and risks and possible benefits of self-treatment. People opt for self-treatment when they don’t want to go to the doctor or other primary care provider. However, a lot of religious, cultural, regional and demographic factors pay an important role in self-treatment as well. Self-treatment, of which, self-medication is the most popular one according to research, is convenient and cost effective for the patient. Usually people who deal with minor illnesses opt for self-treatment and over the counter medication. Another reason for self-treatment is the low socio-economic status of people. People with long, inflexible hours combined with a poor knowledge of medicine tend to use over-the-counter medication rather than visiting the doctor for minor ailments. Moreover, access to a medical facility also plays an important role in self-treatment. People who are less mobile due to a condition, also tend to self-medicate and self-treat themselves upon the onset of another illness. For example, an arthritis patient is less likely to go to a doctor for, say an infection or fever, due to mobility issues. Cultural and feudal norms also play a role in developing countries like Pakistan, when it comes to self-treatment. Women, especially in rural areas, opt for self-treatment because of cultural norms that value faith healers and home-remedies. Furthermore, in many areas women do not prefer to seek medical help from male doctors and thus opt for self-treatment instead. In Pakistan, the diseases with a high rate of self-treatment include: headache (82 percent), fever, malaria, psoriasis, eye disease and chest infections. While admittedly self-treatment helps reduce the burden on primary care providers, in the hands of the less knowledgeable people, it can be detrimental for health. Self-treatment can result in delay in diagnosis, severe drug reactions, adverse reaction to drug, high abuse potential and incorrect method of intake. In terms of self-treatment with medication, many people are unaware of severe adverse effects that can be associated with it. For example, if someone has gastritis and is taking a simple aspirin for headache, then it could worsen their gastric symptoms; but because they don’t have knowledge they could end of worsening their condition. Even self-treatment with herbal medication is not without risk. There could be certain potent ingredients in herbal medication that could harm the patient. There are many cases of adverse drug-herb reaction seen in individuals who opt for self-treatment. Another risk of self-treatment is inadequate dosage calculation. If you accidentally over-medicate the patient, you could end up seriously endangering their life. For kidney or liver patients, the option of self-treating is an even dangerous one because the clearance of the drug from the body is compromised; this means that the drug slowly accumulates in the body and could end up reaching a toxic dose. All these factors are not calculated by a lay person and thus they would not know how to adjust dosage accordingly. As mentioned before, self-treatment is not a complete waste of time. If done carefully, it could end up reducing the burden on the healthcare system and even saving money. For people living in rural areas or those with limited access to medical services, it could end up controlling their symptoms and providing relief. Massage therapy has proven effective for people with arthritis, by increasing their mobility and quality of life. Similarly, herbal teas and therapy provide immense benefit for overcoming certain illnesses. Thus, self-treatment is not completely without benefit to the patient. In conclusion, we see that self-treatment comes with both positive and negative effects. The key is to know when you need a professional’s help and to stop home remedies that could potentially worsen the symptoms. If you are in need of a professional’s help for any health issue, then book an appointment with a top general physician in Lahore, Karachi, and Islamabad through oladoc.com, or call our helpline at 042-3890-0939 for assistance to find the RIGHT professional for your concerns.